University of Nebraska Press, Lincoln and London, 2016. 191 pp., $20.00 pb. Frank Ruda’s Abolishing Freedom is both philosophically and stylistically daring. The book, says Ruda, ‘aims at abolishing freedom in all prevailing senses of the term’ (1). At present, “freedom” has become a term of disorientation. It seems nearly impossible to stand against it, while freedom at the same time increasingly serves to justify systems of oppression. ‘Freedom of speech’ is a rallying cry of the far right. Healthcare, education, and public welfare generally are attacked in the name of freedom of choice. Belligerent and cruel foreign policies as well as the job insecurities of the gig economy are presented as furthering freedom. The list goes on. In an effort to break this impasse, Ruda embraces fatalism. The intent is liberatory; that is, he seeks, through his analysis, to lay out the preconditions for a fundamentally different orientation to freedom, and, invoking Marx, ‘prepare for the real movement that abolishes the present state of things’ (172). Ruda, furthermore, enacts this preparation within a Badouian conceptual landscape: ‘fatalism is an assumption that makes it possible to prepare for what one cannot prepare for—that is, for what Badiou calls an “event”’ (9). The use of fatalism is not unprecedented in the Marxist tradition. Gramsci remarks in the Prison Notebooks ‘how fatalism is nothing other than the clothing worn by real and active will when in a weak position’ (Gramsci 1971, 336). For Gramsci, revolutionary consciousness is energized in times of defeat by the idea that victory is assured in the end by the necessary course of history. Gramsci, like Ruda, rejects mechanistic determinism, but sees a subjective use for fatalism. 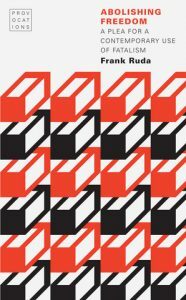 While Ruda’s analysis, like Gramsci’s, is justified by the circumstances of the moment, he goes much further, suggesting that something like his notion of fatalism is metaphysically necessary for finding our way to fundamental change. Toward this end, Ruda seeks to uproot the popular and philosophical tendency to view freedom as a personal capacity (free will) that one always or already has; ‘Reduced to being a capacity, freedom already has its reality (maybe even its full reality) in its possibility’. This, Ruda sees, as a conflation that ‘leads to the idea that freedom is already real without actually being realized’ (3). This naturalization or substantialization of freedom is conceived by Ruda as fundamentally Aristotelian and his task is its removal from the philosophical and social field of play, as its consequence is a kind of totalizing indifference and an ongoing choice to forgo commitment. Because one has freedom of choice, one never has to exercise it. ‘Start by expecting the worst! Act as if you did not exist! Act as if you were not free! Act in such a way that you accept the struggle you cannot flee from! Act in such a way that you never forget to imagine the end of all things! Act as if the apocalypse had already happened! Act as if everything were always already lost! Act as if you were dead! [t]he argumentative style…cannot but be consciously redundant or, in other words, somewhat tautological…This is not the case because I aim to bore my readers but because the counter history of rationalism I present cannot but repeat the very same argumentative move time and again in new and different forms (12). In this vein, he examines a sequence of thinkers: Luther (a kind of prelude to Hegel), Descartes, Kant, Hegel (who is more or less the star of the show here), and Freud. He moves from an emphasis on divine providence in Luther and Descartes to the secular fatalisms of Kant and Hegel. While Ruda’s readings are stimulating, they are also highly selective and speculative, including reflections on Descartes’ contortions regarding the relation of mind to body in the Passions of the Soul and a reading of Kant mainly informed by Kant’s younger, rather obscure contemporary Carl Schmid. Belief emerges from a conversion experience…There is no inner realm (of freedom) from which faith can emerge. Rather ‘my “inner” approaches me radically from “the outer”’ I experience faith only when I encounter God, and I am thus forced to renew myself (16). since all capacities must be realized and are always already exhausted and dissolved when the true freedom of spirit emerges. Philosophy thus cannot be a philosophy of capacities (and therefore cannot be Aristotelian), as it emerges only when everything we are capable of has already vanished (111). The stages of Hegel’s Phenomenology represent attempts to cling to some stability for knowledge and subjectivity. However, for Ruda, ‘the very idea of stability is unsustainable. Reason cannot escape the conclusion that there is nothing to cling to, and this knowledge is continually brought about by the very attempts to escape it.’ This instability is absolute knowing. Knowledge is based on something that cannot be ‘integrated’ into itself. Instead of being an apologist for the status quo, Hegel’s ‘absolute fatalism,’ for Ruda ‘is the very precondition of preparing for that for which we cannot prepare’ (127). Ruda, much like Badiou, uses revolution and falling in love as examples of events for which preparation is impossible. This space that cannot be integrated allows for new subjectivities to emerge via the occurrences of love or revolution, which cannot be chosen. Freedom cannot be a capacity. It cannot exist, for then it could be integrated. What Ruda calls ‘fatalism’ is needed for the emergence of something fundamentally new. What comes to light here is that a different concept of freedom is at stake in psychoanalysis—a freedom that is not in contradiction with determinism and is not a given capacity of my consciousness but something that emerges precisely when I am compelled and coerced (151). for Freud, woman is the name of this peculiar freedom that we know nothing of. But if woman is a name for this choice, this also means that within the female logic woman does not exist (as a fixed entity). Rather woman is a name for this act (163). What of the liberatory project after all of this? Much of the text is devoted to bringing the above-named sequence of thinkers to Ruda’s side. This is part of its performative dimension. Ultimately, whether these interpretations are successful or not has little or no bearing on whether Ruda’s rejection of freedom of choice and freedom as capacity is correct. One thinker that might have been helpful to hear about here is Karl Marx. Early on, Ruda, aligning himself with Marx, at least for the moment, as a critic of freedom, cites the well-known passage from Capital describing the marketplace as ‘in fact a very Eden of the innate rights of man. There alone rule Freedom, Equality, Property, and Bentham’ (2). Ruda’s occasional references to Marx raise many questions regarding his overall project. Is Marx on Ruda’s side or not? Can we make sense of the exploitation of labor without a robust notion of coercion? Does the notion of alienated labour presuppose a notion of freedom as capacity? These questions regarding Marx and freedom are easily multiplied. Gramsci, Antonio 1971 Selections from the Prison Notebooks of Antonio Gramsci ed. and trans. Quintin Hoare and Geoffrey Nowell Smith (New York: International Publishers).